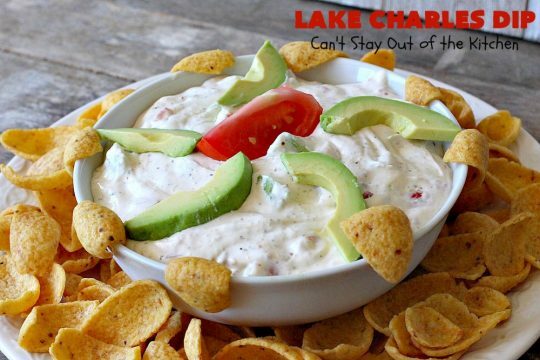 Lake Charles Dip is an awesome recipe for any party. 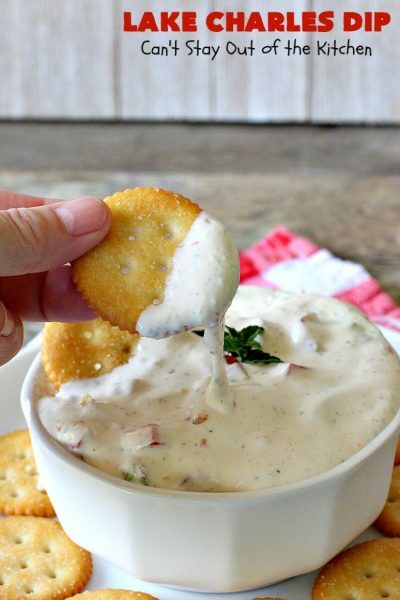 This amazing dip is made with a sour cream and mayonnaise base. 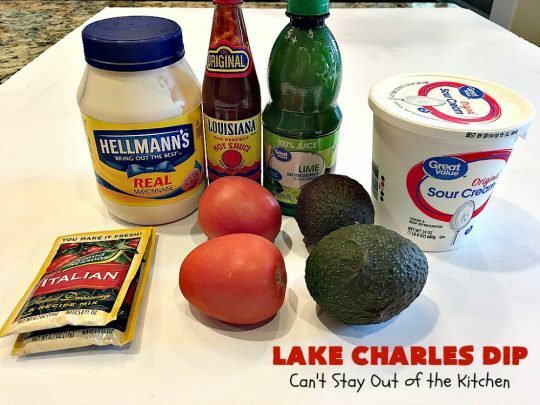 Then it includes Good Seasons Italian Dressing Mix, hot sauce, tomatoes and avocados. The combination is wonderful. I garnished the dip with avocado slices and tomato wedges. Then I served it with both Fritos corn chips and Ritz Crackers. It was incredibly mouthwatering. Back in April we had some neighbors invite us over for dinner. She made a spectacular meal for us that included, Amish Chicken and Noodles, Fried Green Beans, Baked Pineapple, Favorite Fruit Salad, Cajun style Deviled Eggs, and a fantastic Oreo Cookie Dessert. I’ve made most of those recipes multiple times since then. I asked to look through her cookbook and copied down hundreds of recipes I wanted to try. 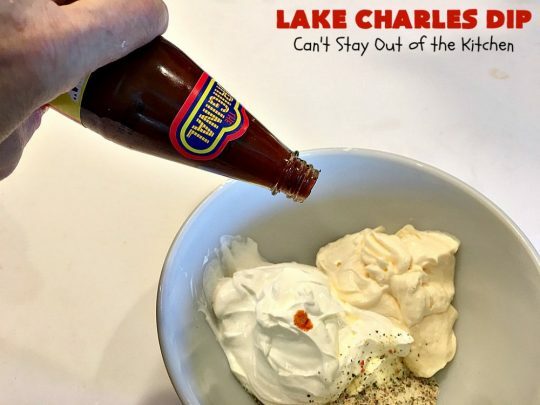 Lake Charles Dip was one of those recipes. I had texted Linda about another recipe I was making and she mentioned how much she liked this one. So I gave it a whirl. I served it for our Friday night care group back in early June. It was very well received (except by my husband who won’t eat anything with avocados.) He doesn’t know what he’s missing! This dip had terrific flavor from the seasoning and hot sauce. The texture was also great by having clumps of avocados and tomatoes. Everyone loved it. I ate it for lunch with crackers or chips for a couple days afterwards. It was also good served on avocado slices and tomato wedges. 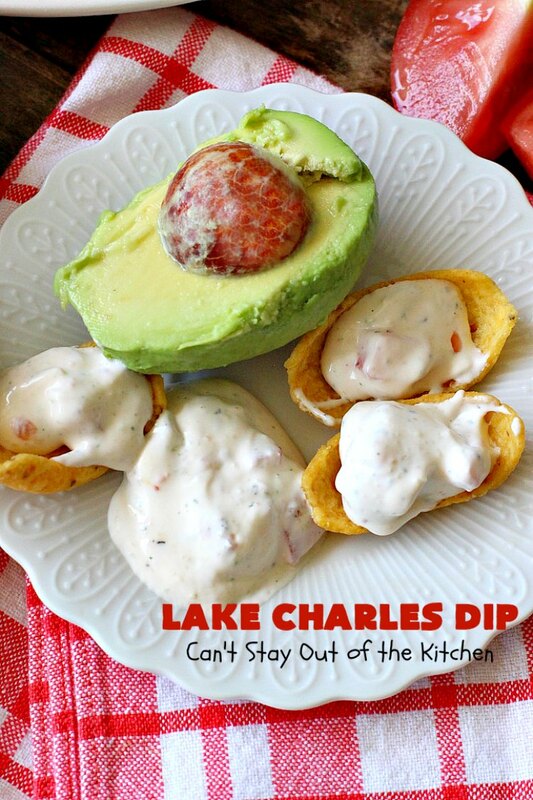 Lake Charles Dip is a wonderful appetizer to serve for tailgating parties. 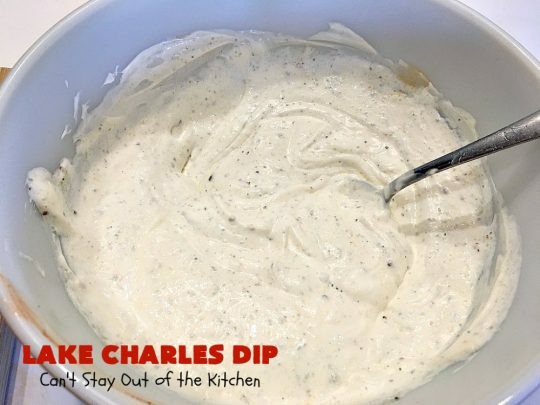 You can whip up a batch in less than 10 minutes. 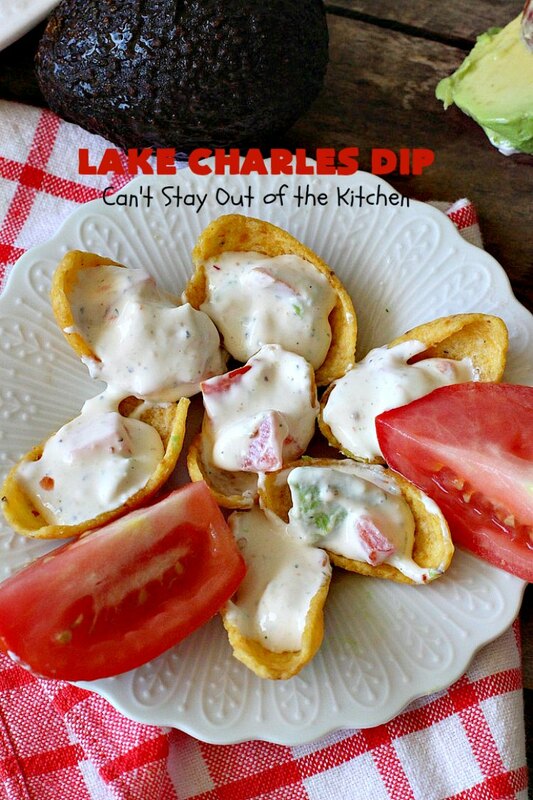 This dip was terrific served with Fritos scoops. I ate bowls of this stuff. Yes, I gobbled up this Lake Charles Dip in quick order! Place mayonnaise, sour cream, Good Seasons Salad Dressing Mix and hot sauce in a mixing bowl. Peel and chop avocados. 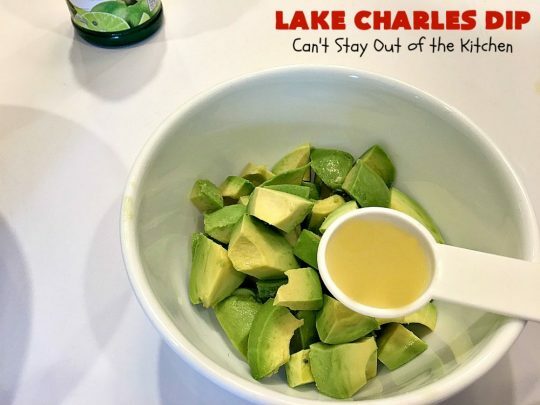 Add lime juice and stir well to coat avocados. Stir to combine. Refrigerate a couple of hours before serving. 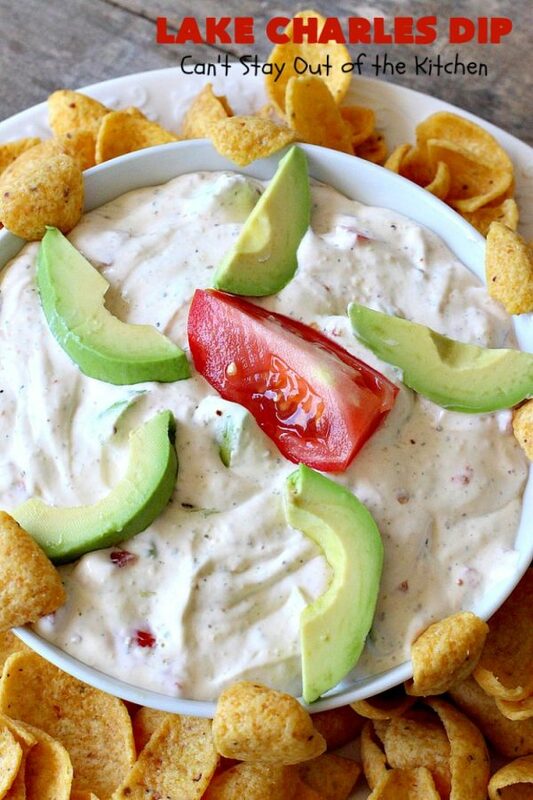 Garnish dip with fresh avocado slices and tomatoes, if desired. Serve Lake Charles Dip with Fritos or Ritz Crackers. 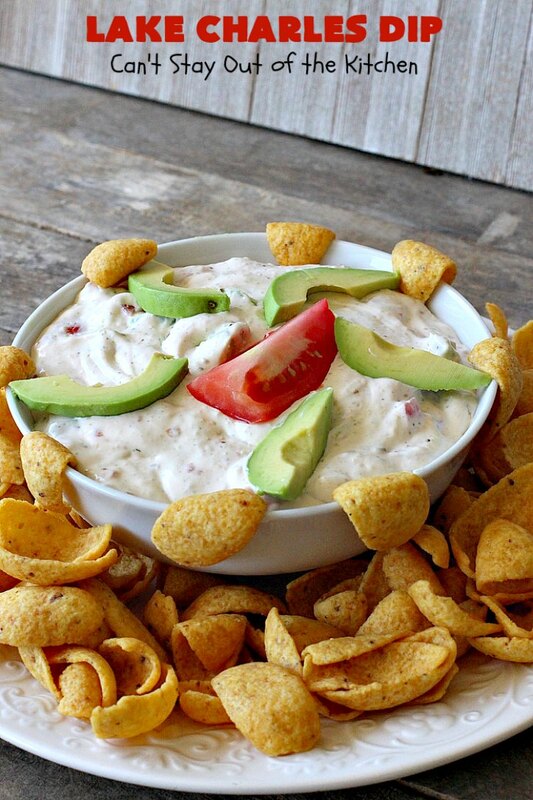 I love avocados, so this dip was a real winner for me. Lake Charles Dip makes one very mouthwatering appetizer. This cajun style appetizer is amazing. 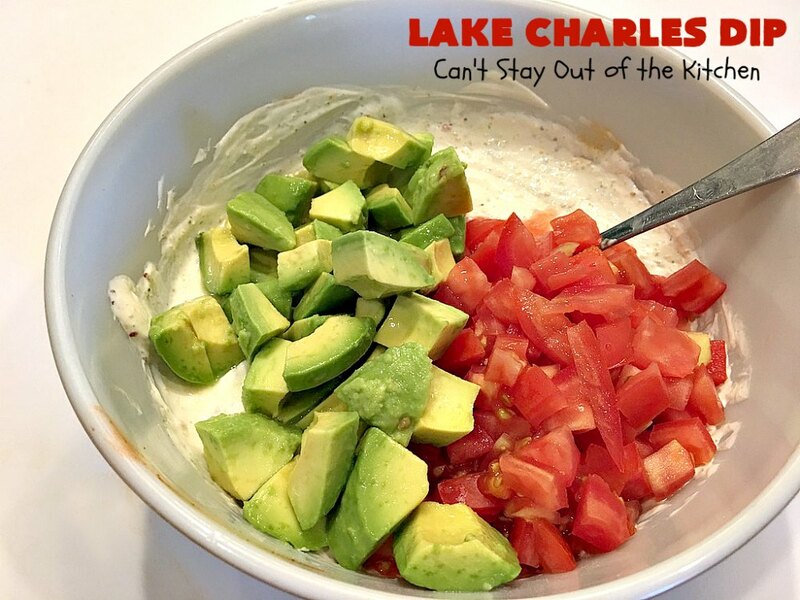 Lake Charles Dip is a delicious cajun appetizer that includes avocados, tomatoes, hot sauce & Good Seasons Italian seasoning mix. 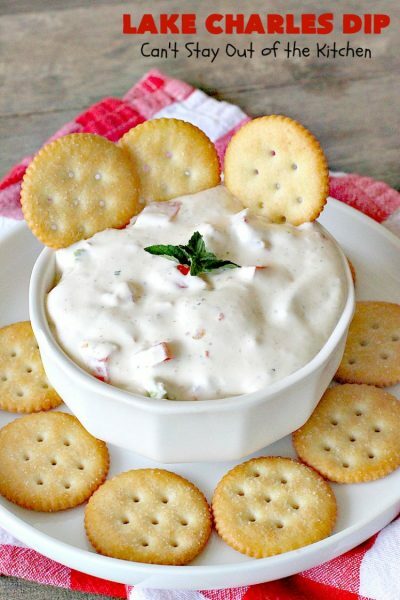 It's perfect for tailgating or office parties, potlucks or backyard barbecues. 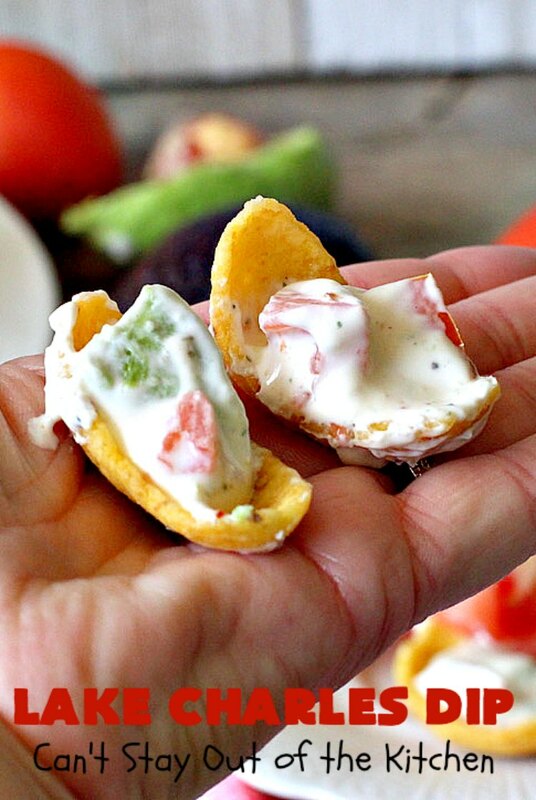 Combine sour cream, mayonnaise, Good Seasonings packets and hot sauce in a mixing bowl. Place chopped avocados in a small bowl. Drizzle with lime juice and stir well to combine. Add to dip with diced roma tomatoes. Mix all ingredients well and chill before serving. 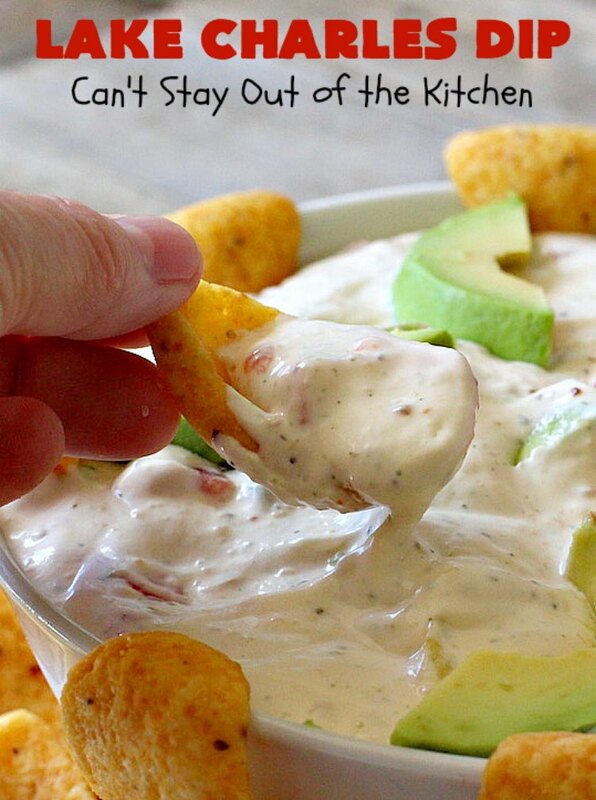 Serve with Fritos, tortilla chips or Ritz crackers. NOTE: Roma tomatoes don’t have as much juice as regular tomatoes making them ideal for this recipe. 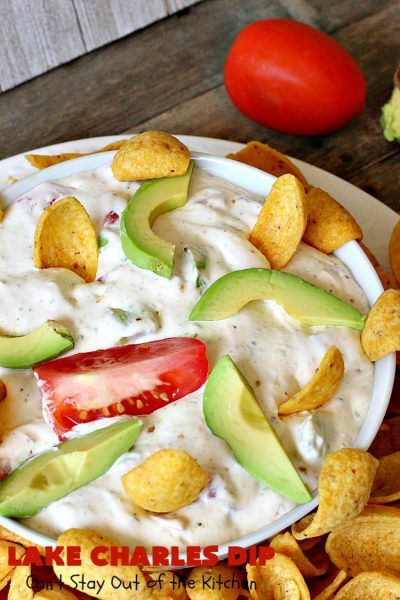 The saltiness from the Fritos was just right with this dip. We salivated over every mouthful. 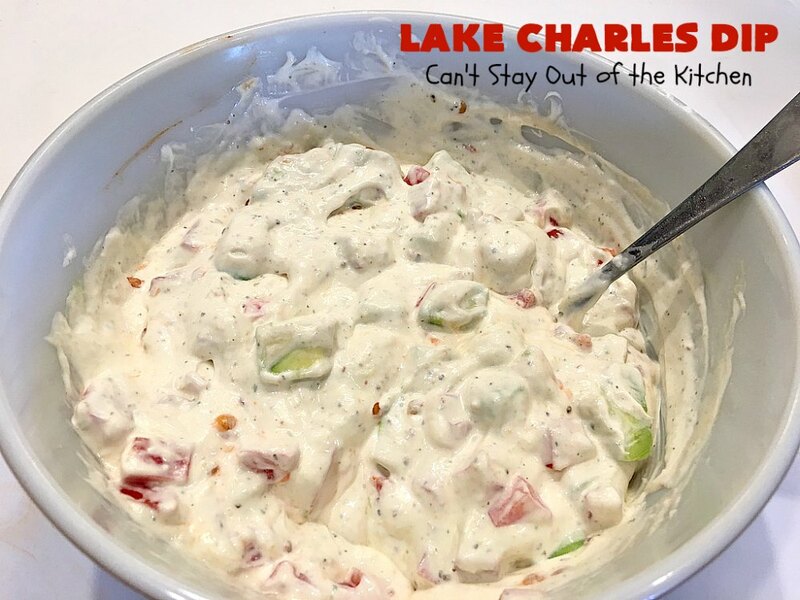 Lake Charles Dip is great to take to parties, potlucks, backyard barbecues or even office parties. 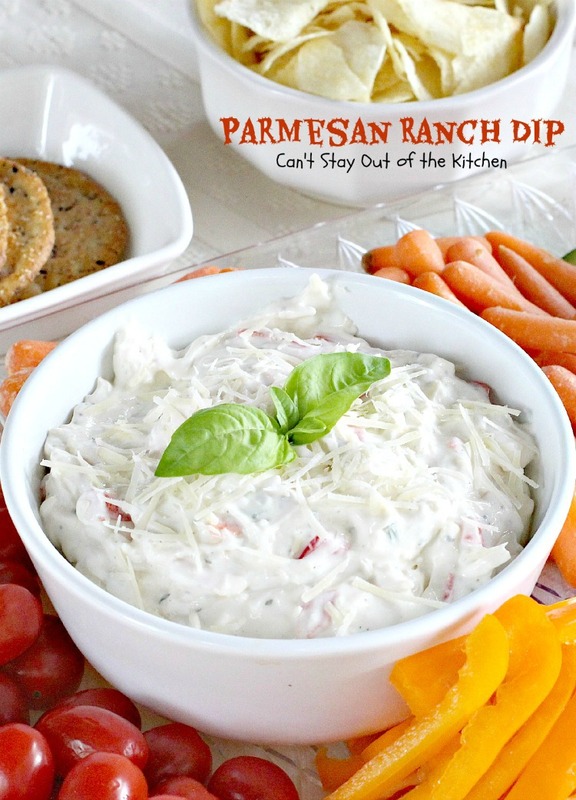 Absolutely loved this dip! Thank you for sharing!!! So glad you liked it. We thought it was terrific too. Do you have to use the avocados or is it something else you could use in its place? Thank You It looks so good! Hi Gayle. 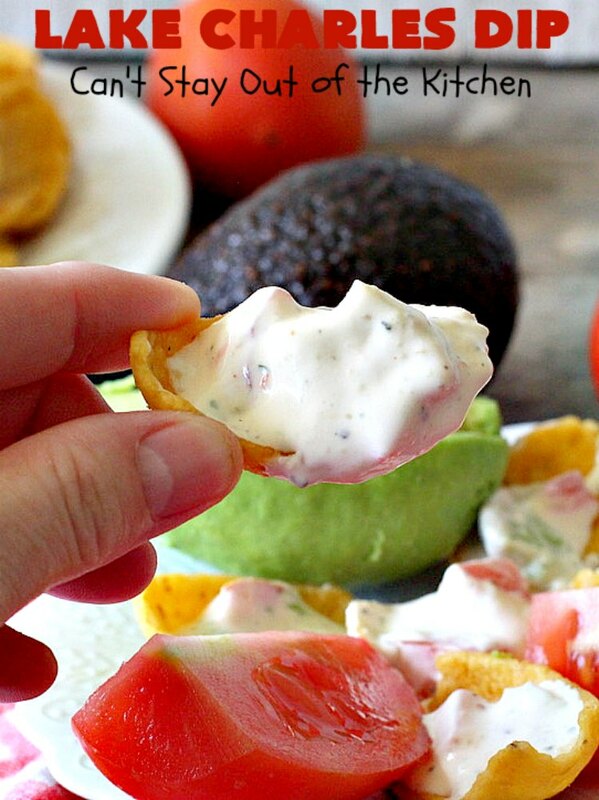 Well, we loved it with avocados, but a possible substitute might be artichokes.